Even if you have perfect eyesight, you can still experience vision problems when you least expect it. Shooting at the range under ideal conditions won’t prepare you for the change in sight picture in the blind or when dusk approaches. So, how do you minimize the halo on your pins? Why are your sight pins blurry but you can see your target just fine? We’ll provide some tips to help you prevent and deal with the culprits that’s causing poor bow sight visibility before you get out in the field – whether it is due to bad eyes or a poor sight set up. Many bow shooters are reluctant to change out their peep they’ve used for several years, or they’re dead-set against going up a size. We get it. Smaller peeps can improve accuracy and enhance sight picture focus. The greater depth of field of small peep diameters provides the eye with the ability to see both the target and the pins clearly. This makes it easier to center your pin and you’ll be confident in your shot since your point of aim will also be your point of impact. However, the ideal target shooting conditions where small peeps of 1/8″ or less shine just won’t cut it in the hunt. Going up to a larger peep size certainly has its drawbacks, but the increased light low light visibility and the full field of view outweigh any negatives. Correctly positioning your peep sight and getting plenty of practice especially in lighting conditions that you could experience while hunting will help you maximize the advantages of hunting with a large size peep. You could always go peepless. It’s not absolutely necessary, but you may find you like using a no-peep system and would never look back. How will you know if you don’t try it out? The concept behind going peepless is to eliminate the issues associated with using a peep. These problems include peep misalignment issues, poor visibility from restricted light to the eyes, and perhaps a dependency on using a peep to shoot your bow. However, it does take getting used to and being willing to achieve correct form. You’ll have to come up with anchor points that you can consistently repeat, even while under pressure-mounting moments in the field. 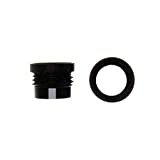 Verifiers are small lenses that screw into your peep sight. They come in different strengths to help clear up fuzzy and blurry sight pins. It’s important to choose the right verifier strength for your vision. You’ll know if your verifier is too weak if your pins are still fuzzy. If a verifier is too strong, the pins will be well-defined, but the target will be blurry. The right verifier will be the one that brings both the pins and the target into perfect clarity. Clarifiers and verifiers often get mixed up. Verifiers clear up blurry pins, and clarifiers clear up a blurry target. The catch with clarifiers is, they’re designed to work with bow scopes where there is a lens in the sight housing involved. Whenever you look through a lens, there is going to be a level of distortion in the sight picture. A clarifier can help correct this to clear things up. It gets threaded into the peep sight, and it comes in different strengths and sizes to fit your peep. Stronger clarifiers should be paired with stronger scope lenses, and weaker clarifiers should be paired with weaker scope lenses. What you want is a sight picture where both the reticle on the bow scope lens and the target are both well-defined and free of any fuzziness and blurriness. The downside when it comes to hunting is, they can restrict your field of view in low light conditions, and you must deal with issues when it comes to using glass such as glare and limited visibility from debris, rain, snow, etc. on surface of lens. Clarifiers are often used with bow scopes to correct for target blurriness when looking through the scope. But, why would you need a bow scope over a hunting bow sight? Those with aging eyes, vision problems, and glasses prescriptions may want to consider a bow scope. It has a lens and reticle that works like a moveable pin system. Often, a blurry target is the problem for aging eyes and nearsightedness, and to compensate for one lens (your glasses) will require the use of another lens (a bow scope). While it may help to clear up your vision problems when bow hunting, you will have to make sure your scope setup complies for the state you plan on using it in. Features such as illumination, laser, magnifying lenses, and any battery-operated components may disqualify your setup for hunting. Spot-Hogg Archery Products - Misc. There may have been a day when you could see your pins regardless of its color in any lighting condition. Thanks to aging eyes, those days may be long gone. Vision problems affect the eye’s ability to distinguish certain colors at different times of day. Without getting into the many types of vision problems that can affect color distinction, we provide a general solution. It might be time to get outside and study what pin colors are easier to see at the times you anticipate being out in the field. Since big game are most active during low light hours, you may want to consider green pins to enhance faster pin acquisition. Yellow may be easily distinguishable during daylight conditions, but red may stand out more than yellow at dawn and dusk. Are your pins too bright? Are they washing out the target picture? Sometimes, you can have too much of a good thing. Overly bright pins can halo, star burst, and wash out everything beyond the pins themselves. Some hunters have tried going down to a smaller size peep. It might help to control the amount of light coming through to the eye, but you can only go so small before the down-sized peep works against you. Others have down-sized their pins. This could be an option if your pins are lit up like glow worms. Again, you can only so small before it won’t work for your hunting style. You can rig things by using electrical tape or a photochromatic cover over the fiber optic to help control pin brightness. The problem might be with your eyes and not with the pins themselves. If the pins are looking awfully bright and fuzzy, you may want to see if a verifier will help clear it up. If you’ve ever hunted from a ground blind, you’ll know that it’s extremely difficult to impossible to see your pins. You have an excellent view of the target, but your pins – not so much. A sight light could be the answer. They get attached to your bow sight and light up the fiber optic ends to make the pins glow. Some have rheostat controls to regulate how bright the pins glow. Remember, you want lit-up pins, not light-flooding pins. The catch is, most sight lights are battery-operated, and many states prohibit lighted and electronic accessories on a bow used for hunting. You’ll have to check game regulations for your hunting area before you pull the trigger on one. Your eyes just might be the single most important asset you can have when bow hunting. Your vision doesn’t have to be perfect as you can change your mindset and bow setup to compensate. When it’s the equipment that’s challenging your ability to see a clear picture, you can make small changes that might make all the difference in the field. Don’t hang your bow up because you think you can’t see. Change something to see better so you can shoot better!